A long lost conversation with a cardinal: “Yes, that spirit has returned. 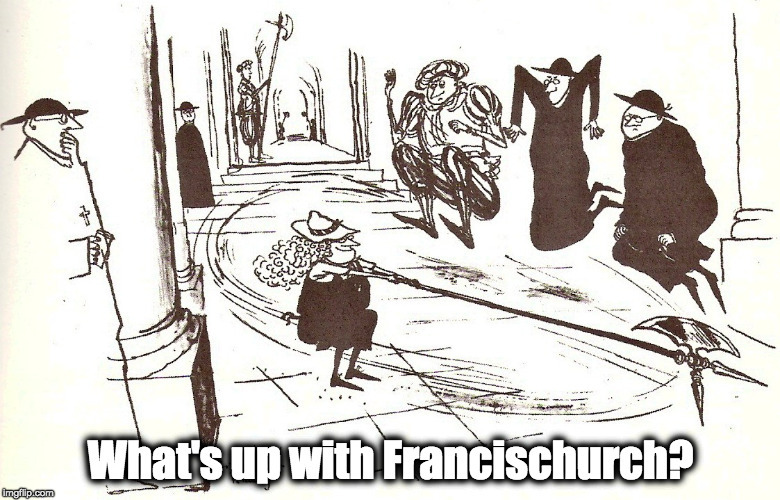 Pray for the Church.” – What's Up With Francis-Church? Maybe it’s not prudent to repost this now. I don’t know. But I’m just thinking way back to a conversation I had with a curial cardinal in at the end of January 2014. I think that given Vigano has gone in to hiding – no joke there – I will not even now identify the cardinal in the story. This is from a blog post I did after I got home – exhausted, a bit ill and very out of sorts – from a few days in a monastery in Tuscany. It just happened to be the patronal feast day of the Abbess of this rather glorious and ancient place. So I was in the guesthouse and was told that I would be sharing a dining room with a Very Important Curial Cardinal, who happened to be an oblate of the house. I was deeply impressed by this man, whose courtly manners were saved from any hint of haughtiness by his evident humility, kindness and good humour. The Mass (Novus ordo) he celebrated for the occasion was beautiful and solemn. I rarely get this sort of impression from anyone associated with the Vatican, and was surprised to find it in him, even though I had known for some time he was one of the “good guys” whom the new pope seemed even then to hate. I will never forget the pleasure of sharing meals with this man and his secretary – who kindly translated all our conversations. Breakfast lunch and dinner for three days. We talked of many things, benedictinism, gardening, Tuscany, how strange it is to live in a foreign country… Not as much about the Church as you might expect. But in the end he was surprisingly forthcoming. So, get home and no one’s been here for three days and the house is freezing, dark and damp. Cat’s gone insane with loneliness and is hungry and doesn’t know whether to claw me in fury for leaving her by herself again or leap into my arms in joy at having company. She circles back and forth, follows me around the house as I put things away and putter aimlessly about, demanding to be picked up again every time I put her down to do something with my left hand. In the end I just decide to carry her around under one arm. She dangles there, purring rather pathetically and squeaking now and then. It’s raining and dark and horrible out and I’m cold, damp, cranky and wildly out of sorts. So, I go to turn the heat on. I stagger out onto the balcony and squint at the digital display, which is flashing double-zeros. It does that when it’s not been turned on for a few days. You have to twist the dial thingy under it until the display shows 1.1, then push the button twice. So, I’m sitting here, now, three hours later wondering why the house is still freezing. Yeah, it’s because you have to actually twist the dial thingy and push the button twice, instead of just thinking that you ought to do that and then getting distracted and wandering off to do something else because your brain has stopped working. Why has my brain stopped working? Because nuns. Nuns, even though you tell them plainly, “I can’t eat sugar” seem not to be able to understand what “I” and “can’t” and “eat” and “sugar” mean when you put them together into a sentence. Maybe they thought it means “I’m not going to take sugar in my tea today” or “I’ll take it easy on the biscuits”. It was a really nice lunch, and the cardinal was very famous and important, but also extremely intelligent, holy and Catholic and friendly, and the dessert – which was a combination of sugar, egg whites, sugar, whipped cream, sugar, chocolate and a bit of sugar on top – of which there were exactly three, one each, was clearly purchased specially for the occasion. I more or less had to eat it because the nun was standing right there looking all “If you don’t eat that, our little nunny feelings are going to be hurt”. So I ate it. And then I packed up and got on the train and went home, and by the time I was in Florence looking for a train to Rome, I was in full insulin shock melt-down. It’s like being drugged. First you get insanely thirsty, then you realise you can’t see or think straight, then the sleepiness hits you like one of those curare-laced darts those guys use in the Amazon to hunt monkeys, and you slide off into a kind of opium-like state of altered consciousness and physical paralysis that you’re disinclined to call “sleep” because of all the interesting nightmares. When this wears off – and the train is pulling into Termini – you swim back up blearily to a state of semi-consciousness and discover you have a headache that feels like the top of your head is being removed by a tiny man inside your skull with a little Lego-sized jackhammer. Somehow, you find yourself at the home-track and sitting on the train, but you don’t remember how you got there, except that there were crowds involved, and possibly some shouting. The blue flickering light on the train, and the suffocating heat (it’s “winter” don’t you know!) combine to crank up the crankiness to a fever pitch… oh wait, no, that’s just a fever. When you get off the train, you carry your coat over your arm because you’ve been sweltering in that damn train car for an hour and a half and the rain and the coolth are like a blessing from a forgiving God. It’s cold. I’m home. The Tiber and the Arno look like they’re about to flood. Somehow, that retreat didn’t quite work out the way I’d hoped.